Welcome to the home of ExaChess! ExaChess is a powerful, full-featured chess-database program for the Macintosh. It can manage a database of millions of master games, serve as a chessboard to play through games, and be used as a tool to record and annotate your own games, to play games against the computer, or to play perfect endgames. See Features and Screenshots below to find out more, and Ordering for pricing, ordering and contact details. ExaChess Lite is a freeware version of ExaChess which provides most of the features of ExaChess in a version suitable for maintaining a personal games collection. You can download ExaChess Lite from this web site. ExaChess [Pro] 4.5b6, a beta version of the next release of ExaChess, is now available to registered users of ExaChess. You will need to go to the ExaChess Downloads page from within ExaChess to download it. Direct support (without conversion) of PGN, ChessBase (CBF), and NICBase databases, as well as ExaChess's own database formats. Search across any number of databases or just a single database file by player name, event, year, result, ECO code, opening name, position, partial position, material, special game features, or any combination of these. Resizable, customizable 2-D color board with smooth animation. Flexible game parser that handles free-form text input, both algebraic and descriptive, including move and position evaluations, variations and text comments. Records full tree of moves. Switch to variation or return to main line. Shows opening tree (next moves for any opening position) with stats from the database. Quickly find matching games in database for any opening position. Supports play against external 'chess engines' or against the database via the UCI protocol or Apple Events, including Fruit 2.1 (supplied), ZZZZZZ (supplied), Hiarcs, Crafty, GnuChess, and MacChess. Supports automatic annotation of chess games via the chess engines. No 256-game restriction on individual database files; no 8-database limit on the number of databases which can be simultaneously searched; and no limit on the number of game or database windows that can be open at once. Printing of games with figurines, diagrams and full annotations. Publication of games to a web page complete with animated chessboard and direct access to game positions by clicking on a move; or as formatted RTF text including figurines and diagrams. Access to special website to download over 700,000 master games and more than 300 MB of Ken Thompson's endgame tables for perfect 5-piece endgames. 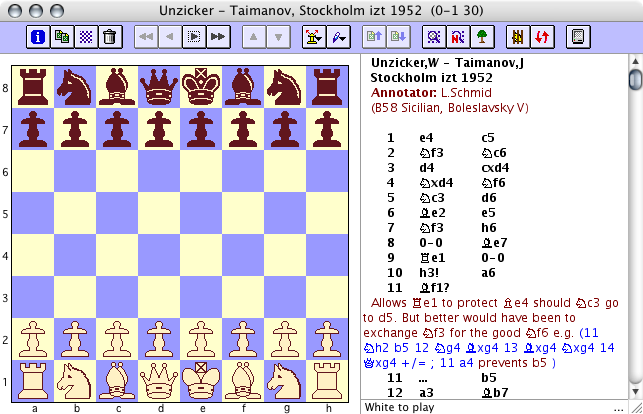 Chess games are presented in a Game window that looks like this. The window is resizable, you can use other chess fonts in place of the built-in piece set, and can set the color of the board and pieces. Databases are shown through a database window. The window is resizable and the column widths are adjustable. 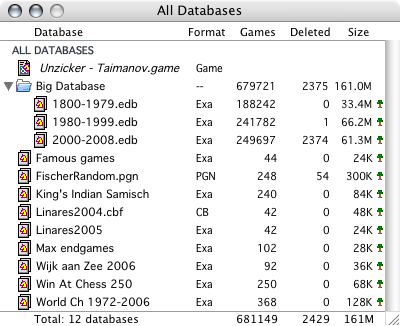 The optional sidebar lists all databases in the ExaChess Games folder. Clicking on one or more databases shows the games from those databases. 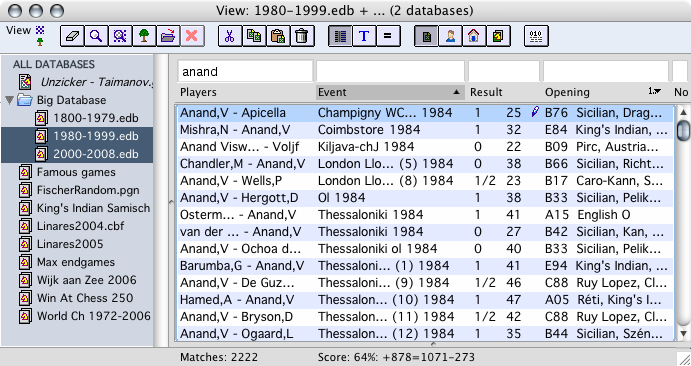 Searching for games within such a selection of databases is very easy and very fast: Enter information into any of the Players, Event, Result, Opening or No. field and ExaChess will filter the displayed games to only those that match the entered information. In addition you can do a wide range of positional searches through a simple dialog. Databases are simply placed in the ExaChess Games folder and can then be accessed from the Games menu or the sidebar of a database window. The All Databases window lists all the databases, their formats, and the number of games in them. Universal Binary ExaChess now runs native under Intel as well as PPC. ExaChess requires OS X 10.3.9 or later; users wanting a version that runs under earlier releases of OS X need to use ExaChess 3.1.3. Application Package. ExaChess is now distributed as an application package represented by a single icon. There is no longer a separate ExaChess Games or Tools folder to install. Support for UCI Engines. ExaChess now supports UCI Engines. The very strong Fruit 2.2.1 engine is now included in the ExaChess distribution. Improved Reliability with Large Databases. ExaChess has been extensively tested with large databases up to 4 million games. Databases of over 80,000 games are now kept as a bundle or package (a single Finder icon) avoiding past problems with an over-large resource fork. Sidebar with Database List. The All Databases list is now shown as a sidebar at the left side of any database window. Clicking on a database or set of databases changes the window to show that database or a view of the selected databases. Views. Views have been radically overhauled: A new view now shows all games immediately and opens instantly. Selecting a folder from the Games menu or double clicking it in the All Databases window opens a new view of all databases in the folder. Selecting New View from the database window opens a view of all games of the selected databases in the All Databases window. Web Export. Chess games exported to the web are now compatible with a much wider variety of browsers, including Safari, Firefox, Opera, Camino; and on Windows: IE6, IE7 and Firefox. Templates now use style sheets and avoid frames and tables. Checking for Updates. ExaChess now checks automatically for updates and notifies you when an updated release is available. Electronic Delivery. ExaChess is now delivered entirely over the Internet. ExaChess customers can directly download the 600K master-level games (150 MB) and 33 endgame tablebases (300 MB); there is no longer any need to wait for airmail delivery of a CD. A Spanish language module has been added. Thank you to Carlos Fernando González for the translation. The ExaChess Downloader script (which runs on selecting File > Download Games) has been updated to accommodate a change in the site hosting TWIC games. This change was made silently in 4.0.2 copies downloaded after April 2010. The ExaChess Updater script (which runs automatically or by selecting ExaChess > Check for Updates) has been updated so it now runs under Mac OS 10.7 Lion. HOWEVER, it requires some changes to run on PowerPC systems - contact us for more information. What can I do with ExaChess? If you use a Mac and enjoy chess, whether as a casual player wanting a bit of fun or as a serious student of the game, then ExaChess has something to offer you. Use it for entertainment. Pick a game at random and play through it -- choose a game by one of the leading grandmasters from a recent tournament, or a classic win by a past champion, or a quick win in one of your favourite openings, or a recent pawn and rook ending. A chess database gives you instant replays at a pace you control of thousands of entertaining games. Study openings. Assemble a collection of games in one of your favorite openings, or defenses, or a new line you are trying to learn. Find what other players have played in the same positions, and with what success ratios. Play against the database to check for holes in your opening repertoire or to check your memory. Explore deviations off the main line. Study middlegame themes and combinations. Look for combinations and sacrifices. Find how the Masters proceed as a particular opening line moves into the middlegame. Study endgames. Find where a rook draws against rook and pawn. When do bishops of opposite color draw and when don't they? Prepare a database. Build a database of your own games, or of games from a recent or historical event. ExaChess has a powerful game parser to extract games with annotations from a wide range of text sources. It allows fast duplicate finding and removal, easy merging of games with other databases, conversion of databases to other file formats, and can use databases in other file formats without conversion. ExaChess as a chessboard. It's easy to move the pieces, take back moves, add annotations, keep a move tree of all the lines you explore. Play through a game. It's quicker than setting up a board. You can instantly wind the game back or forward to any point. Move entry is easy: type the moves, choose them from a menu, drag pieces with the mouse, or use the move prediction feature to just click on the destination square and have ExaChess play the most likely piece to that square. Use as an analysis board. It's ideal for correspondence chess. Try out and save all your candidate moves and all sidelines of play with all their sub-sidelines. Once you investigate any line of play, you have it forever. No more going back through the same lines, over and over. Add comments. ExaChess makes it easy to keep detailed annotations on any number of games in progress. A huge advantage over analyzing with a board and pieces. ExaChess as a chess partner. Its built-in engine lets you play against the database to test your opening repertoire. It works with external chess engines, providing the user interface while a chess playing program calculates the moves, and can host a match between two chess playing programs. Play speed chess against the computer. Or play serious games. Practise banging out opening moves in your favorite lines, or checkmating your opponent when you have a large material edge but only seconds left on the clock. Analyse your own games. Play through them again. Ask a chess engine to find its best move in a critical position, or to annotate the whole game. Play against the computer in a side variation -- can you still win? ExaChess as a chess publisher. It can directly print games with full formatting, figurines and diagrams. It can export a single game or a whole database of games with formatting, figurines, and diagrams in RTF (Rich Text Format) format for import into word processors or page layout programs. Annotate your own games and print the analysis. Write your own book of best games. Publish a book on an opening you've studied with example games from the database.